We’ve been working hard to improve the Instagram section of the Social Media tool, so here it is — the Instagram Report version 2.0. Let’s get straight to the overview! Above all else these reports allow you to compare your Instagram posts’ performance to your competitors within a selected period of time. With this in mind, let’s review each report in detail. First of all, we would like to introduce two brand new reports — Activity and Hashtags. Next comes the rest of them, updated and fresh — Post, Audience and Engagement. The new Activity report allows you to track all your Instagram activity in a flash, such as your post performance and publishing trend. 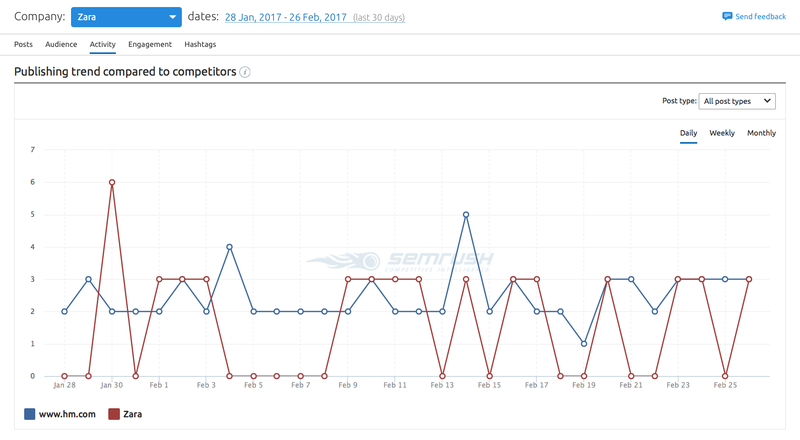 Narrow comparison graphs make it easy to check if you are keeping pace with your competitors. The new Hashtag report provides you with a list of hashtags used in Instagram posts. Here you can see which hashtags perform the best and check which ones your posts have in common with your competitors’. This report will give you a clear idea of which of them you should use to improve your engagement rate. The Post report allows you to view Instagram posts, both yours and your competitors’, one by one, including URLs and related engagement data. The report also got a handy update — to research faster and more efficiently, you can filter posts by hashtag and type of content — video or photo. The Audience report provides you with data on any changes in your number of followers, and the best thing is that it does so in the form of a handy graph. With this latest update now you can track follower trends on a daily, weekly or monthly basis. The Engagement report shows you essential engagement metrics and how they’ve changed over time. Here you can see the results of your efforts, which are reflected in your audience’s reaction to the Instagram posts. Don’t forget to take a peek at what your competitors are doing! As in the previous report, now you can track engagement trend on a daily, weekly or monthly basis. What do you think about this update? We are always waiting for your comments and ideas, please share them with us at [email protected], and stay tuned! Eager to know more about Social Media tool?